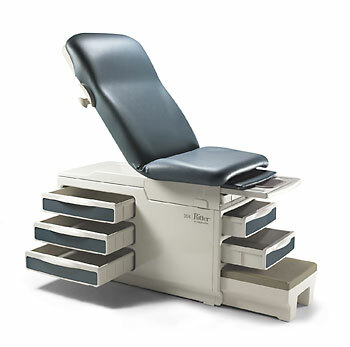 The Ritter 204 Manual Exam Table. Featuring the latest in design, comfort and functionality in a manual exam table, it truly offers efficient patient care. What makes Ritter the most purchased brand of exam tables in the industry? 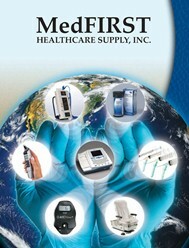 It’s our willingness to research, study and listen, so that we can meet your needs… and the needs of your patients. We found that you need an exam table that allows easy access for patients, making them feel secure; three side drawers for optimal supply management; modern styling to coordinate with your office; an updated, ergonomic top design to help patients feel comfortable; and additional weight capacity to handle heavy patients. One-piece seamless drawers have easy-to-clean rounded edges and are designed to contain spilled fluids, keeping them from other areas of the table, thereby improving infection control. The ergonomic design of the upholstered top is as soft and comfortable as it looks, leaving your patients feeling more relaxed. The seamless upholstery eliminates areas where dirt and bacteria can accumulate so clean-up is easier, faster, and more effective. The one-piece, upholstered top can be easily removed without tools, allowing a thorough cleaning or a quick upholstery color change. We increased the size of the footstep over 40 percent above the industry standard. This allows patients to feel more secure and get on the table more confidently… putting minimal strain and stress on physicians or their staff. The step has an easy-to-clean, slip resistant surface with rounded edges for added security. And, the step is reinforced with steel to minimize deflection, providing the patient an increased sense of stability. Three spacious side drawers provide plenty of storage volume for gowns, drapes, and other items, yet are made to help organize your assortment of smaller supplies and bulk supplies. In addition, there are two front drawers for easy access to items during pelvic exams. Today’s increasing patient weight puts added demands on exam tables. The Ritter 204 is designed to safely support more weight than standard manual exam tables – 500 pounds. A low cost option, the Soft Touch upholstery top gives a soft and functional alternative for your practice. Steel Reinforced Seat to support patient in seated position (prevents seat deflection and future breakage). Comfort designed stirrups help make the lithotomy position a little easier for your patients.